The Federal Reserve has hiked interest rates twice in 2018, and the market is bracing for two more by the end of the year. The debt load continues to remain elevated with over $1 trillion in loans outstanding, negatively impacting debt to equity ratios. This obviously matters in a rising rate environment. Rising rates will continue to challenge small cap companies as 31 percent of their total debt outstanding is floating-rate compared to just 9 percent for larger companies. Net debt in the Russell 2000 is higher than it was in 2007, and financial leverage now needs to be front and center as asset allocators think about portfolio positioning going into 2019. Source: FactSet, Empirical Research Partners Analysis. Could higher borrowing costs trigger a default cycle? It is very possible. But at a minimum, we believe it will challenge the quality profile of companies late in the earnings cycle. Rising rates will continue to pressure unprofitable companies near peak valuations as sensitivity around tighter credit conditions increases. Time Period: 1/1/1990 – 12/31/2018. Source: Strategas. Since 2009, low interest rates and attractive credit conditions have helped small cap companies expand with increased borrowing, M&A and corporate buybacks. Nearly 10 years later, we can see this has been a windfall for shareholders as stock prices have soared. When you look at the fundamentals of the companies in the Russell 2000, we see a different story. Profitable companies today are spending roughly a third of their earnings on interest payments, which is the worst data point we have seen since 2008. Additionally, the leverage has not helped the underlying operating nature of the business with return on assets dropping to as little as 2 percent. As we look forward over the next two to three years, we see that debt maturing for companies in the Russell 2000 skyrocketing five to seven times. Highly leveraged companies tend to default or may see their stock prices decline as the market discounts the changing credit landscape creating an opportunity for asset allocators to shift their allocations as we enter into a new market regime. As of 12/31/2018. Source: Strategas. And credit quality may matter even more. Passive investing in small caps at this stage in the cycle exposes you to unintended risks and larger drawdowns. We believe the shift in asset allocation needs to emphasize higher quality versus growth and momentum at any valuation that has dominated the landscape. High-quality earners are in relatively short supply at this stage in the cycle, and we believe will be bid higher as profitability across the broader index continues to come under pressure. In this scenario, growth and momentum stocks will likely underperform, unmasking what’s really happening beneath the surface across the small cap spectrum, exposing leveraged companies. Identifying companies with attractive relative value and credit quality characteristics is an edge at this stage in the market. History has shown that unprofitable companies have much higher downside capture ratios than profitable companies and could underperform during the next downturn if past is prologue. Quality and value will be an important part of the asset allocation mix as we look out the next three to five years in the small cap asset class and anticipate the new alpha opportunity. Source: FRP and FactSet; as of 12/31/18. 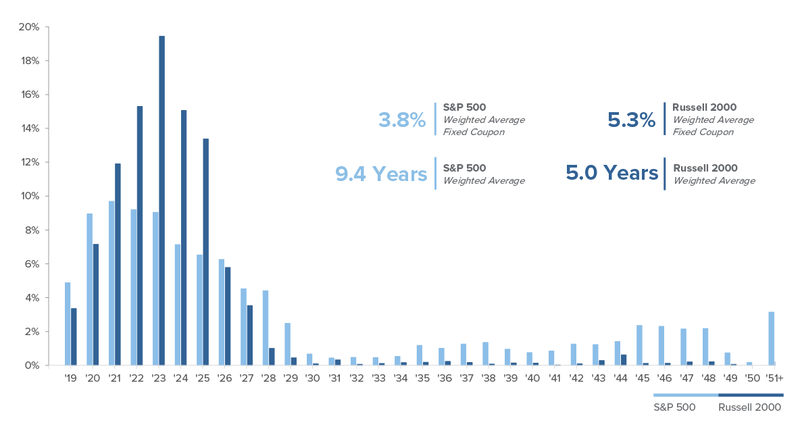 There are specific risks inherent in small cap investing such as greater share price volatility as compared to other funds that invest in stocks of companies with larger and potentially more stable market capitalizations.